RUN pip install "flask==1.0.1" "CairoSVG==2.1.3"
You can see the converted PNG by opening http://localhost:5000/image in the browser. The complete source code can be found on GitHub in the project cairosvg-on-alpine. The GNU Compiler Collection aka gcc is missing. We can fix that by installing build-base via apk. Yes! We finally made it! 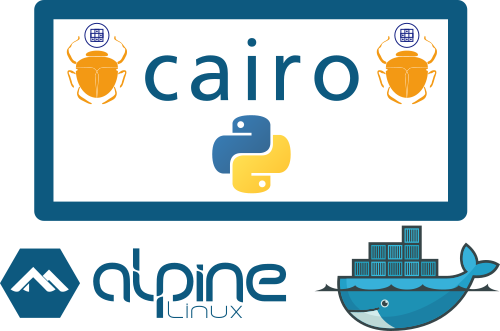 Our Alpine Docker container with CairoSVG and Cairo is up and running. Opening http://localhost:5000/image in the browser will show the converted PNG. During development, we don’t want to rebuild the Alpine Docker image after every change in the Python script. Fortunately, it’s easy to execute the script locally because, on Ubuntu, we don’t have to install all these native C libraries (tested with Ubuntu 17.04). Most likely, this means that Pillow couldn’t be installed by pip because the mentioned native C libraries are missing. Try sudo apt-get install python3-dev python3-setuptools libjpeg8-dev zlib1g-dev libfreetype6-dev liblcms2-dev libwebp-dev tcl8.5-dev tk8.5-dev.